Eye On Golf: How much are you willing to pay for a round of golf? How much are you willing to pay for a round of golf? So the question for today, my dear golfing friends, is what is public golf access? To put it another way, how much are you willing to pay for a round of golf? What prompted this reflection is the upcoming U.S. Open at Pebble Beach Golf Links. Pebble Beach, as you know, is open to the public – if you have enough money? The current price is $495 for a round of golf. For most this is a bit exorbitant, a touch on the high side of the green fee scale. Others will go great extremes to come up with the prescribed fare. For a few classic stories on what it might take for most of us to unfold $495, we recommend Randall Mell’s fun story at TheGolfChannel.com. To put all of this is perspective, allow me to relay this short story. We spent the summers of 2005 and 2006 in Buffalo, Wyoming. Now Buffalo has a wonderful, scenic 18-hole golf course. It sits right at the base of the Big Horn Mountains and is appropriately designated as the Buffalo Golf Club. The course is regularly listed in the top five in the state. At the time we were there, the cost of a membership was $450 for a couple to play unlimited golf. (The cost is now $500 per year.) This included only the greens fee. Carts, if you so desired, we an additional charge. 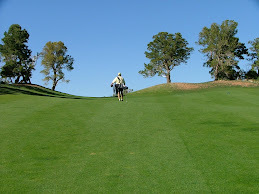 Yes, there were a couple of steep climbs from green to tee, but if you sucked in your gut, walking was no problem. My common statement to folks was that you could play a whole season in Buffalo, WY for about the same cost as one round of golf at Pebble Beach.